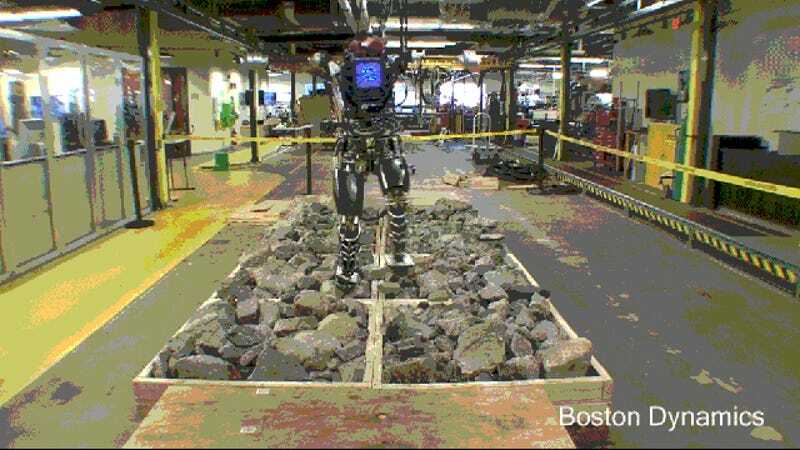 As we creep closer to the Robotics Challenge officially getting under way, Boston Dynamics gives us another glimpse of its DARPA-funded ATLAS robot being tested in the lab. This time we get to see the unsettling peek at our future carefully tip-toeing its away across a rock-strewn simulated debris field, with surprising ease and balance. The robot's still not quite ready for primetime just yet, after all, scampering over rocks is a challenge that most toddlers can handle with relative ease. But remember, we only got our first look at ATLAS back in July, and this is how far the robot's advanced since then. At this pace by Christmas it will be ready for grade school, and by sometime next summer it should be graduating college with all the tools it needs to start usurping humanity.